Ah, the charmed life of a New York Times columnist: you can say anything you want, true or not. German social spending is almost 6 percentage points above the OECD average—and 9 points above the U.S. It’s higher than every one of the PIIGS. Ireland’s is almost 3 points below the average. But, hey, it’s always fun to moralize! In times of crisis our inner values and character comes out to help us understand the crisis. For many, including Mr. Brooks, it’s the binary of the virtuous vs. the lazy. A classic analysis dating back to the Protestant world view. Of course the flip side is true for the other side, it was the fault of the fascistic northerners. There is a problem with this kind of thinking: it’s steeped on oversimplification and ignorance. Simple binaries help us cope with the complexity of our world: The world has lazy people and hard working people. God, rewards the hard workers with wealth. Of course the subsistence farmer in a semi arid country is never considered hard working. Hard workers amass wealth and stuff. Like the Saudis for example. But, wait, they were not included in the example of “virtue” given by Mr. Brooks. The hard working Frankfurt bankers and the Wall Street financiers, did not help the Greek Conservative government before Papandreou hide the deficits with clever tools. No, it was not Moody’s that missed all the signals and collected fees to rate Greek bonds. The French and German banks who kept buying bonds were not wrong to think: the Eurozone will bail them out, no problem. Siemens did not profit from billions in contracts with the Greek government. Greece being one of the highest military spending nations did not benefit weapons manufacturers in France or US. Nope. It was simple, the lazy vs. the hard workers. You see, Mr. Brooks, knows us Greeks and he knows we are lazy, tax evading, anarchists. He has read the newspapers and bought the idea that the Greeks need to submit to collective punishment. It was not the bad structure of the Eurozone, of course the hard working Northern Europeans would never make such a mistake. The easy binary has served many generations before Mr. Brooks and it will continue to serve him here and those who love easy binaries in other nations. It seems many confuse easy for right. He said Germans “are being asked to bail out nations with vast public sectors.” The nations in trouble do not have “vast public sectors.” Nor do they have high wages. Their problem is that they’re in the same currency zone as Germany despite not being as technologically advanced or as productive. That’s the underlying problem. But Brooks would rather draw cheap moral lessons. How did so much of the total amount of money in Europe get concentrated in so few hands ? It wasn’t because the rich work harder. If the money was spread out more evenly, there would be money for the Greek 99% to pay taxes. People confuse productivity with working hard and long. Germany has some of the shortest work weeks in the OECD, Greece some of the longest. It has to do with the structure and technological penetration of the workplace. When I was in Naxos, I saw Greek families spend entire evenings unraveling fishing line, and making a bit of a social event of it. This just doesn’t happen in advanced capitalist societies, for better or worse. I am guessing the productive societies then create value by adding all the psychiatric services, the pharmaceutical products, the books, the dating and social networks that need to be created to imitate the social and cultural merits to relieve the social isolation and alienation of their citizens. Not to mention the public service announcements. Stellaa — nice, sharp, dead on. And all those “productive” activities **do** elevate GDP, no? Brooks talks of bailing out nations with vast public sectors whereas your chart is about social spending. In countries such as Greece surely the government owns quite a few enterprises maybe more than in Germany. Certainly looking at social spending as percentage of GDP is not at all the same as looking at the relative size of public sectors in different countries. 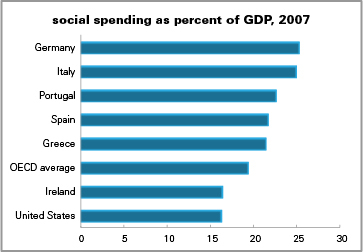 However the chart does show that you can have considerable social spending without a debt crisis and that suggests that it is not social programs that need to be cut to solve a debt crisis. Maybe a little off topic, however, Marketing your online business is going to cost you, either in time or money.